The online version of this article ( https://doi.org/10.1186/s13550-019-0496-7) contains supplementary material, which is available to authorized users. Similar to thymidine, 18F-FLT once internalized into the cytoplasm is phosphorylated into 18F-FLT monophosphate by thymidine kinase 1 (TK1) that has the particularity to become trapped inside the cell without being incorporated into the DNA . Alternatively, in the de novo synthesis pathway, deoxyuridine monophosphate is converted to thymidine monophosphate by thymidine synthase which can be phosphorylated and incorporated into DNA . 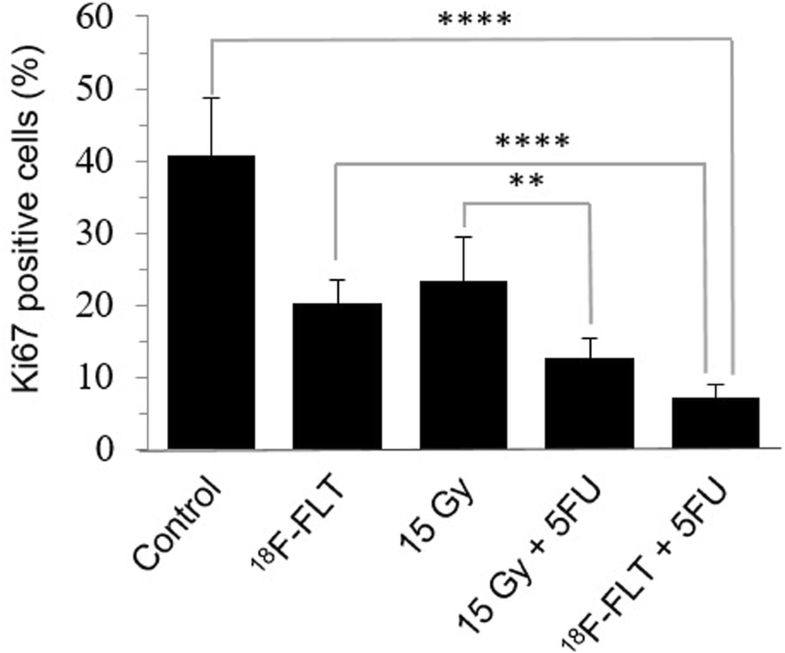 The accumulation of 18F-FLT is dependent on the presence of TK1, which is closely associated with cellular proliferation , and poor prognosis for cancer patients . 18F-FLT has therefore the unique potential to preferably target this group of poor prognosis cancers. 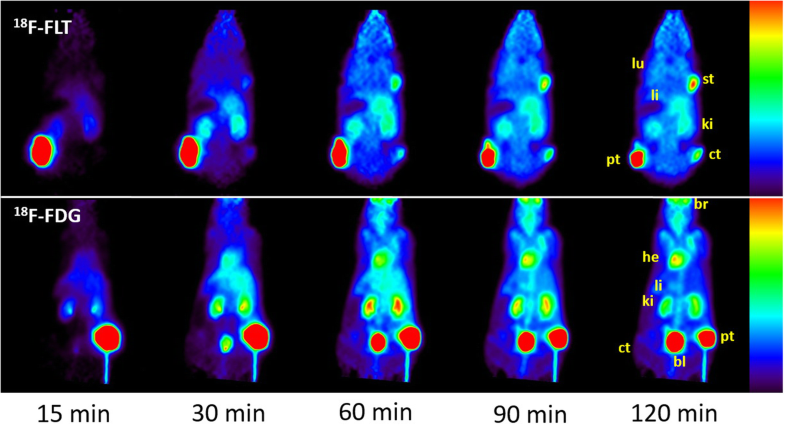 Preclinical and clinical studies have demonstrated a considerable interest in 18F-FLT as a PET tracer in breast, lung, and brain cancer imaging [4, 7, 10, 11, 12]. 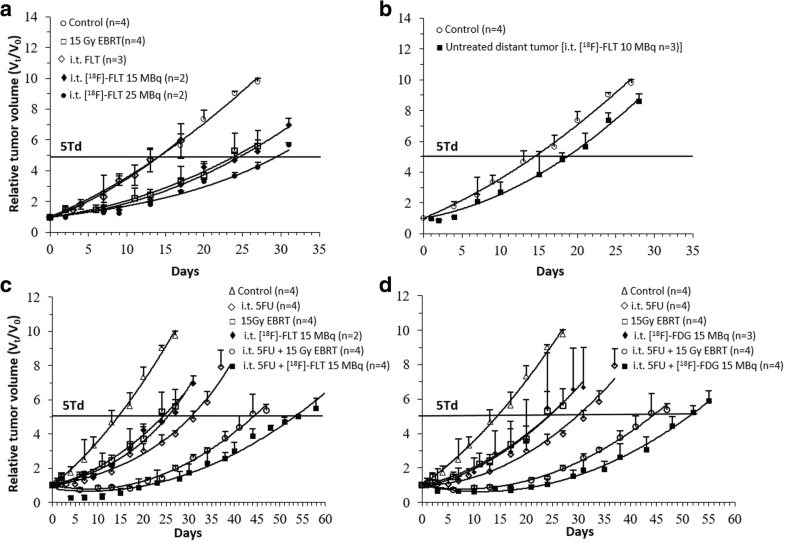 18F-FLT PET has been previously shown to provide valuable information for response assessment of tumor therapies [3, 7], and it has found limited use for tumor therapy follow-up in clinical trials [8, 13]. 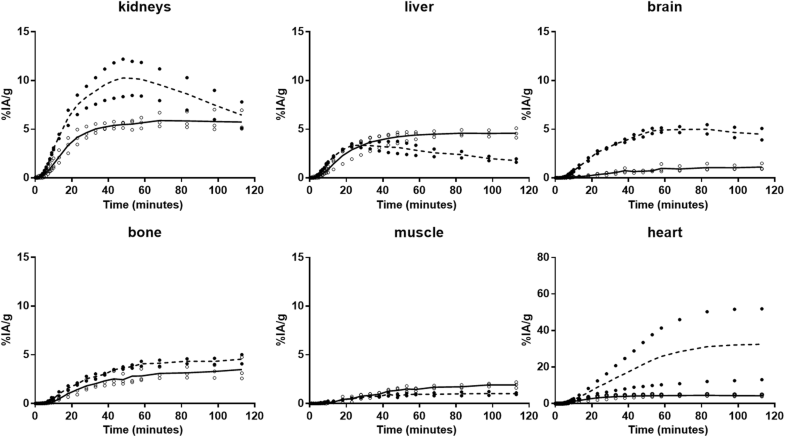 18F-FLT tumor uptake is generally lower than that of 2-deoxy-2-[18F]-fluoro-D-glucose (18F-FDG), but its selectivity for tumor versus inflammatory cells often makes it a better marker of tumor cells than the glucose analog, 18F-FDG . Moreover, 18F-FLT showed low uptake in the brain and heart, in contrast to 18F-FDG, confirming its higher tumor specificity . The only limitation remains the detection and measurement of bone tumors and metastases, due to the high 18F-FLT uptake in healthy bone marrow. Previous studies have demonstrated the therapeutic potential of positrons in the colon, breast carcinoma, and lung metastases upon i.v. or intraperitoneal (i.p.) injection of 18F-FDG [17, 37, 38, 39]. Fang et al. reported an improvement of tumor response in a mouse model, compared to a control group, in colon cancer treated with 55.5 to 222 MBq of 18F-FDG via i.p. administration. However, no significant difference between treated groups was observed . In the present study, the dose range of 18F-FLT used in i.t. injection was an order of magnitude lower than in these earlier studies. 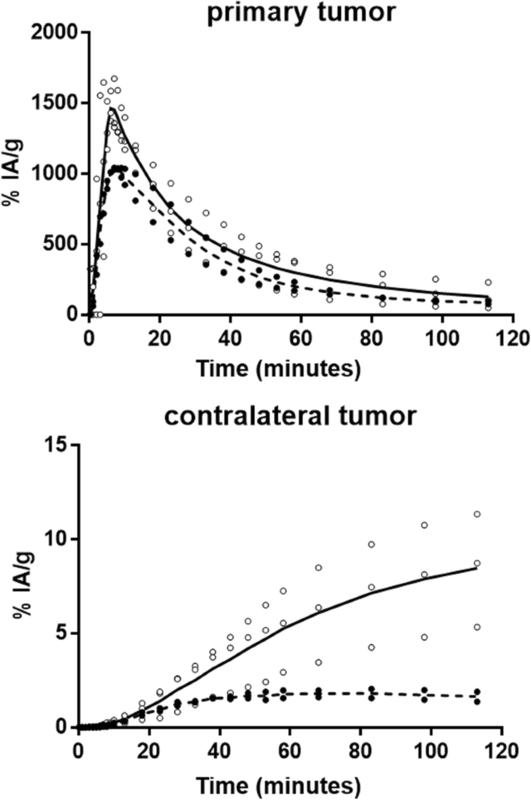 Nevertheless, a significant tumor growth delay relative to the control group was observed after i.t. injection of 15 MBq 18F-FLT. 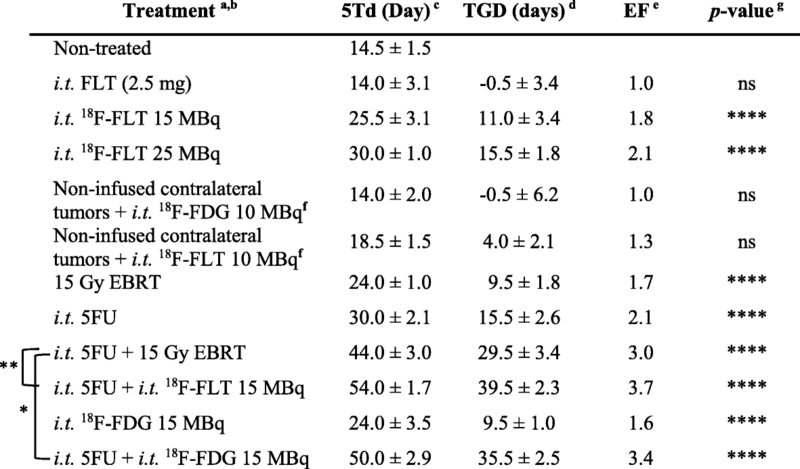 Similar TGDs and EFs were observed for tumors treated with 15 MBq of 18F-FLT and those receiving 15 Gy EBRT. Despite a similar response to treatment, it is somewhat difficult to correlate these two results together. 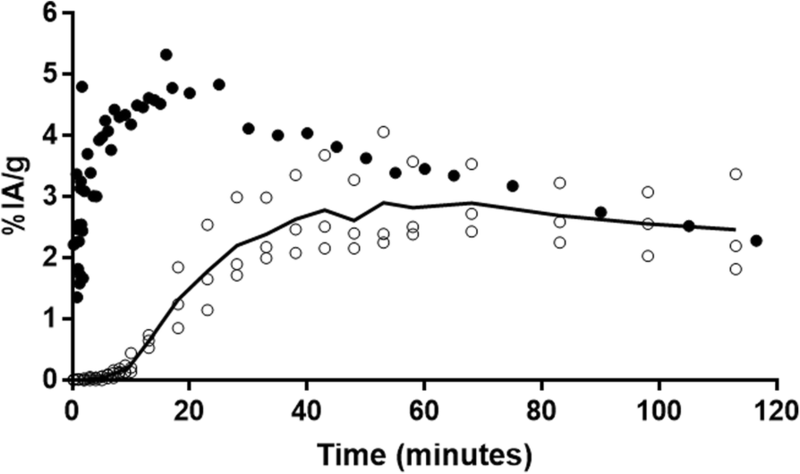 Our experiment with the Fricke dosimeter demonstrated that the radiation dose delivered to the tumor from the i.t. injection of 15 MBq of 18F-FLT (assuming that all the radiation energy of 18F-FLT remains in the tumor) is received lower than that from EBRT for the same biological effect. 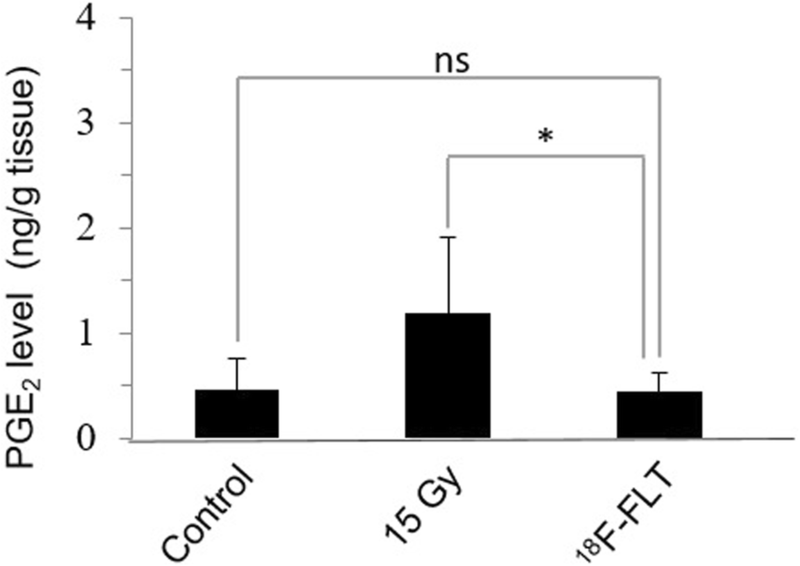 Therefore, our results suggest that a therapeutic benefit from direct exposure to positron emitting agents can be achieved with local 18F-radiotherapy. 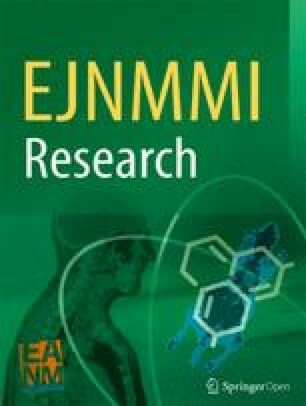 Moreover, considering the advances in TRT [41, 42], other radionuclides bound to molecules capable of reaching preferentially cancer cells could be injected directly into the primary tumor by CED, which is a clinical practice being increasingly applied to chemotherapy . Recent developments in targeted PET imaging based on metabolism, angiogenesis, receptor-mediated antibodies, etc., may offer promising theranostic options, as already pointed out by others [43, 44, 45]. As in the present work, combining CED to the increased cancer cell specificity of these tracers relative to 18F-FDG could widen the range of PET radiopharmaceuticals potentially useful for therapy of not only well-localized tumors, but also their metastases.